Rommel’s First Desert Blitzkrieg scenario book for Fireball Forward WW2 Rules. I believe that most wargamers recall looking at maps of North Africa as kids and marveling at the various arrows depicting Rommel’s advance in Operation Sonneblume. They fascinated us. Here is a chance to get down on the ground in the desert and fight out those battles. Generalleutnant Erwin Rommel and the Deutsches Afrikakorps blaze across the Libyan Desert in a lightning attack that lays waste the forces of the British Empire defending the road into Egypt. Driving fear into the hearts of their enemies, Rommel’s German blitzkrieg carves the name “Desert Fox” into history. 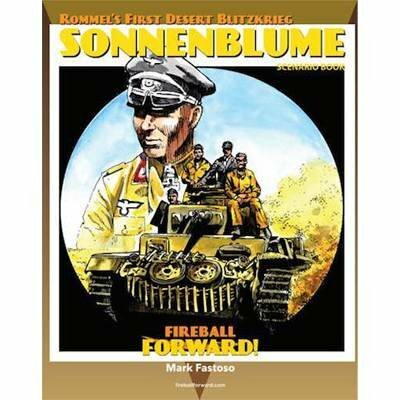 Sonnenblume: Rommel’s First Desert Blitzkrieg offers you eleven action-packed scenarios featuring tank battles, Italian allies, armored car assaults…and hours of fun. This is a scenario book and you will need the core rules for Fireball Forward to play the game.